Congratulations! You’ve said “yes” to start the next chapter of your life and it’s official: you’re engaged! Before you start climbing the mountain of wedding planning, it’s time to start thinking about how you would like to announce your engagement. From sharing a picture of your gorgeous ring on social media to calling up friends and families to announce the news, there are many different ways to share your engagement with others. Many couples choose to share this fantastic step in their relationship by hiring a photographer for some social media and save-the-date-worthy shots. 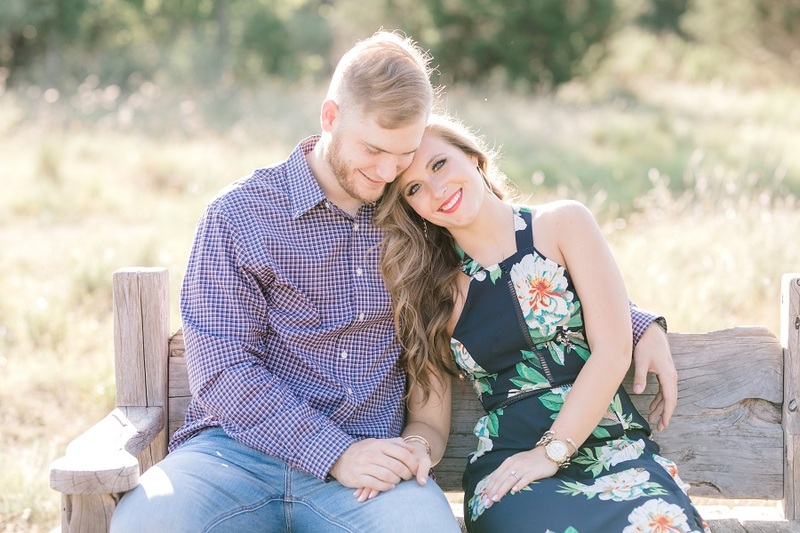 No matter how you choose to share this moment with your friends and family, your engagement photos are a great opportunity to capture the beginning of this chapter in your life, so it’s important that you look as great as you feel! When choosing your engagement photo outfits, be aware of what season you plan on having the photos taken. 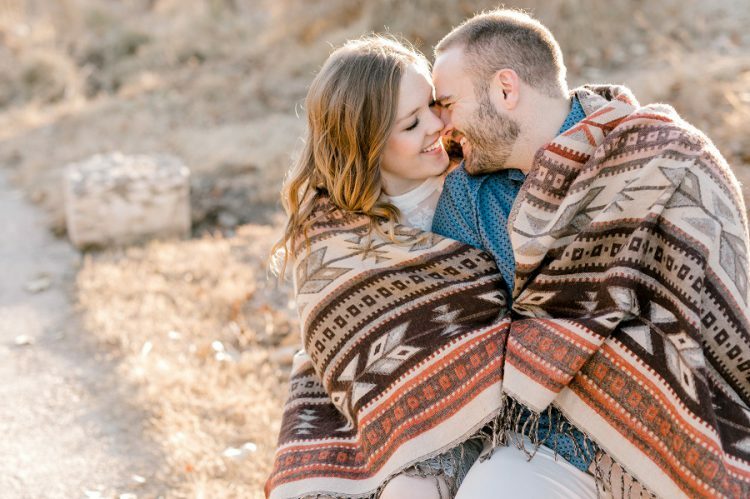 For example, you wouldn’t want to be wearing shorts and a t-shirt if your engagement photos were being taken in the winter, and perhaps you wouldn’t wear a sweater and jeans for summer photos. If you want your engagement photos to emulate the look of a particular season, this may require you to wait before you can take them. That’s perfectly okay! This is your way of remembering this moment in your life and it’s up to you to make sure the details are exactly as you imagine them. Spring – For spring engagement photos, think of light, flowy, materials and a pastel color palette. Lighter layers would look clean and fresh, and keep in mind the beautiful florals you could incorporate! Any of these beautiful spring dresses from Tobi would look gorgeous on a bride-to-be for a springtime photo shoot! Summer – Summer is the perfect opportunity to play around with your outfit choices. From cute shorts and fitted t-shirts to sun hats and sunglasses, summer is the chance to give your outfit an edge with an accessory. Lighter fabrics are ideal and, depending on your photoshoot location, a bright colored wardrobe would pop in the summer sun. Fall – In this cozy and colorful season, try wearing outfits that have layers. Sweaters, light jackets, and cardigans are all great choices. Pair a layered look with a dark jean and boots and you’re all set. Dark and rich colors like maroon or olive green make the perfect choice for cute fall engagement outfits. Winter – Stay warm in a fitted jacket or cute pair of gloves and matching hat! For this enchanting season, you could play around with the colors and texture of your wardrobe. Snow-covered backdrops will make the colors of your outfit stand out, and warm textures will look stylish as you smile in a winter wonderland. Choosing a theme for your engagement photos can help you narrow down your outfit choices. The theme of your engagement photos could be representative of your personalities, the future theme of your wedding, or even just a style that you enjoy. Don’t hesitate to bring a change of outfits in case you would like multiple looks for your engagement photos. A great option to save on your engagement photo outfit is to rent your attire. Rent the Runway offers a variety of outfit choices for ladies that are sure to look elegant and sophisticated. For gentlemen, save on purchasing a suit or tuxedo and look into one of the stylish and affordable tuxedo and suit rentals offered from The Black Tux. Don’t be afraid to try an outfit you haven’t before or wear a choice that is a little different from your usual style. The location of your engagement photos is an excellent way to determine what you should wear. For some couples, they see themselves taking their photos on a warm beach at sunset. Other couples have always envisioned their engagement photos taken in the mountains. Choosing your location helps you narrow down your outfit choices, as well as envision how your engagement photos are going to come out. Talk to your photographer about locations that would provide the best lighting, most beautiful backdrops, and opportunities for stunning pictures. Your engagement photos are a way to remember the start of planning the next chapter of your life. Don’t be afraid to try an outfit that you normally wouldn’t or stick to a theme that personifies both your and your fiance’s personalities. Play around with different outfit choices and, in the end, choose outfits that bring your vision to life. 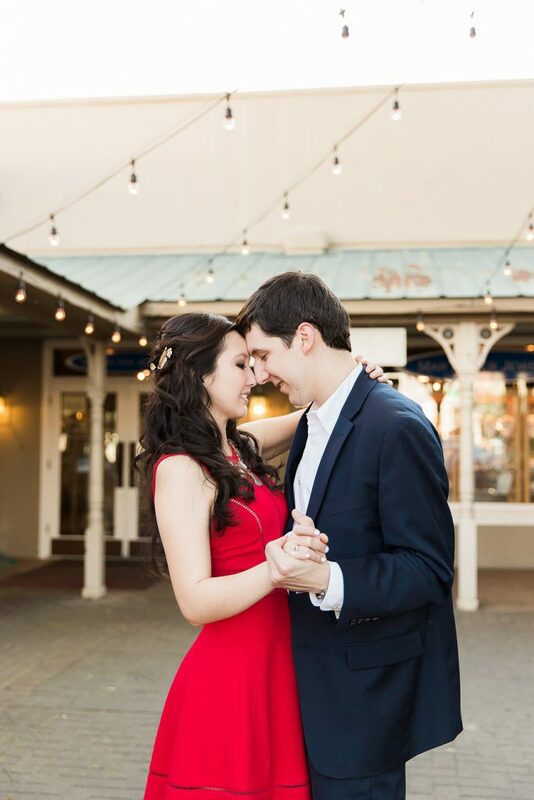 Have fun with your engagement photos and remember to enjoy the calm before the wedding planning! Thank you to Monica Roberts Photography for the use of their imagery in this post! I like the theme of the more formal red-black-white motif. As photogrpapher, I would not encourage the other two due to distractions of the clothing. I don’t see any color harmony in the first one. My opinion, based on my training and experience, is that in this kind of photograph attention should go to the faces and all elements of the composition should be in color harmony. At least the third one is interesting from the standpoint of the knit pattern continuing across the couple, but if I were doing the session, I would also want to get some in simpler warm-toned clothing.